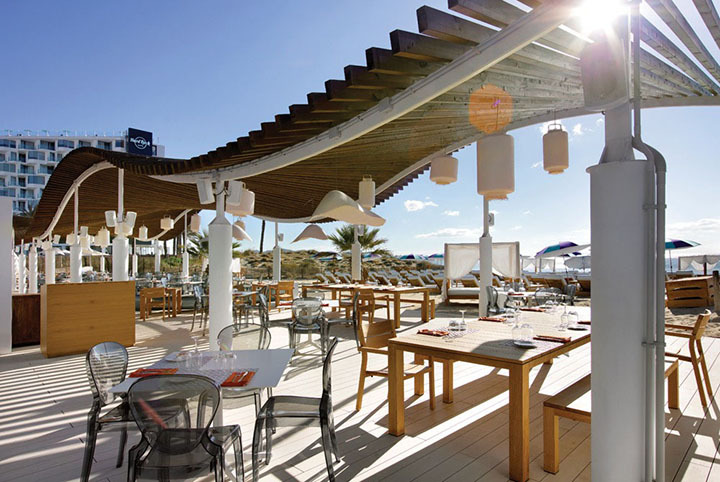 If you’re looking for a place to have a great meal right on the beach-front, The Beach at Hard Rock Hotel Ibiza is just the place for you. A range of flavours to satisfy the most discerning palates, in a ground-breaking setting… Ibizan red prawns, octopus with puréed piquillo peppers and crunchy artichokes, or black risotto with ricotta cheese… Healthy vegan options include barley salad with vegetables and vegetarian tacos. Enjoy genuine Mediterranean cuisine with a wide range of salads, seafood, fish, rice, and meat dishes: the perfect meal to enjoy at the seaside. And what would you like to drink? The best international cocktails. All this, together with the finest live music and a superb atmosphere in one of the island’s most attractive spots. Round off the experience with a sweet, refreshing glass of Hierbas Ibicencas mousse or our chocolate flavoured with hints of pineapple, coconut and crunchy almond: an explosion of flavours for the senses.